Anyone seeking engulfment in the throb and thrum of the low- end frequencies- and sometimes nothing else will do- look no further than Roto Vildblomma, released in May 2010 on Dimitris Kariofilis’ Antifrost label. 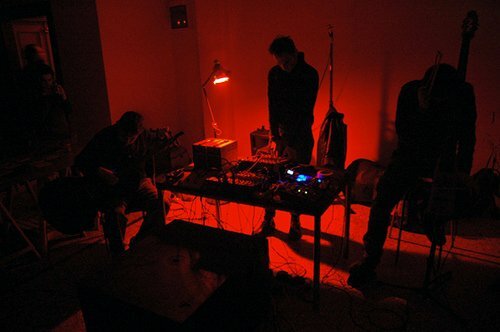 Kariofilis, a.k.a., ILIOS, meshes his oscillators with the seething drawn strings of cellist Nikos Veliotis and contrabassist Costantino Luca Rolando Kiriakos , a.k.a., Coti K.
Following the brief, anthemic first track, we are immersed in tremors and troubled waters that push the air [and your innards] around, unrelieved save for a motoric development on the fourth track, an acceleration, as oxymoronic as that sounds, of Mohammad’s pervasive gravitas. 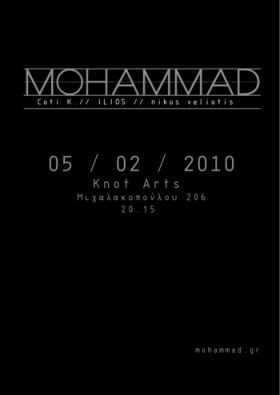 Mohammad create a nearly seamless garment, satisfyingly replete with the frayed, loose ends such harmonically close, pitch-based drone works reveal. Another reviewer referenced the “religious” aura of their sound; while I think I hear what he was referring to, I would suggest a different coloration- ceremonial. For what rite this sort of low-end strum might be created, who knows? I do know the two individuals I have heard from who have caught Mohammad’s sound in live performance report the experience is overwhelmingly powerful. Mohammad have dedicated their collective efforts to the subtle striations of the low-end strings, and Roto Vildblomma is, for me, without a dull or stray moment. This entry was posted in music writing on November 24, 2010 by jessewgoin.